Comparing a series of satellite images from different periods a Californian hydrologist discovered in 1983 that a huge white spot had taken the place of the vast Kara Bogaz Gol gulf (literally “dark gullet” in Turkmen) in the south-east corner of the Caspian. The gulf had simply disappeared. What, he wondered, had happened? How could such a large volume of water have evaporated in just a few years, only to be replaced by a salty dustbowl? 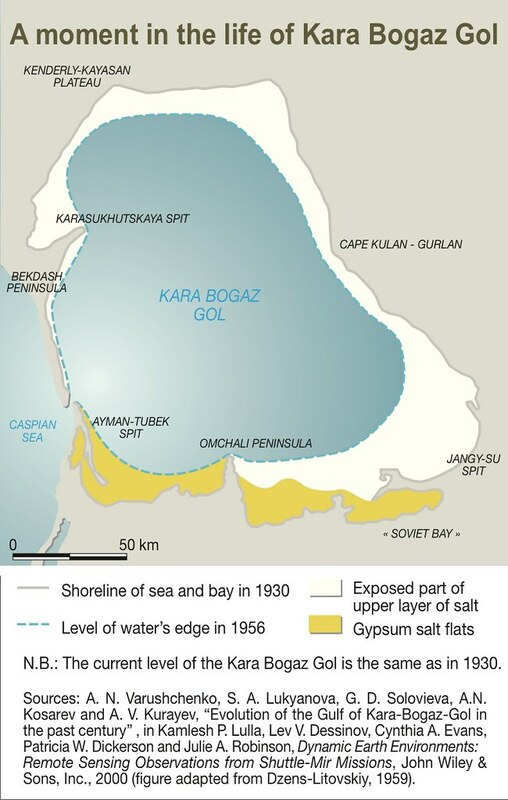 As Frank Westerman relates in his book “Ingenieurs van de ziel”, it wasn’t the first time the Kara Bogaz Gol gulf had been at the centre of a mystery. For more than three centuries it has inspired extravagant tales told by local sailors. In 1727, for instance, a Russian navigator tried to explore the gulf, starting from the Caspian Sea, but gave up, because his crew saw a foaming gully, into which the sea water was rushing with untold force, and refused to go any further. A century later, in 1847, Lieutenant Jerebtsov, a maritime explorer and cartographer of the Tsar, undertook to map the contours of the Caspian, discovering, according to Konstantin Paustovsky, the gloomy coastline and entrance to the gulf. Many traders and sailors have given accounts of their terror at the entry to the Kara Bogaz Gol gulf. Awesome tales were common, peppered with claims that the inlet was a whirlpool leading to a gulf where the water disappeared into the depths.